Make no mistake, Chateau d’Etoges is a pretty exclusive hotel. Situated in its own wooded parkland on the route between Strasbourg and Paris, this beautiful building is surrounded by a moat and numerous fountains and ponds. Accommodating guests since 1991, Chateau d’Etoges dates back to the 12th century with modifications having been made in the 16th. 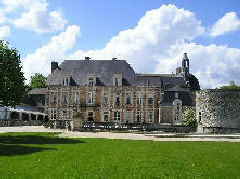 The Chateau was used by several Kings of France as a staging post when travelling to their eastern dominions - Louis XIV, the Sun King, was particularly taken with the water features, and it is also said that Louis XVI stayed here during his flight to Varennes in 1791. Another famous name from history who is reputed to have visited Chateau d’Etoges is Napoleon Bonaparte. Today the hotel features 28 guest rooms in all, divided between the main castle and the orangery. Well behaved dogs are welcome (extra charges may apply).